I’m getting an error when I try to install the addon. I recommend installing it via placing it into the folder for add ons. The install from file can be unstable at times and not work. there is a tutorial for to realize mesh for 3D print? not particularly. Just export the mesh to preform and prepare a print. I had a pretty easy time. I might do that sometime. is Inserts in HOps something like a demo of Pitiwazou’s Asset Manager? Can I add my own modeled parts to insert in HOps? yes theyre just there to help with imagination. I didnt bother with asset management because the support would take away from other hops things. Plus AM exists! if i buy this, how many upgrades im allowed to do? Do i have to buy any other plugins to work? Thanks anyway. hard ops will get updates until version 1 or until we are done. hard ops works fine alone. Hi, I’m using hardops 9. I love it! I have encountered some issues thoug. I can’t get (C) Slash to work and I can’t (C) Merge or (S) Merge when I use red inserts. Is there some addons or other conditions required for it to work properly? update blender. You are using version 2.77. Damned! It was in front of my eyes the whole time! I guess thats what you get when you work on two computers with 3 different versions of blender. It seems to work fine with 2.78. Sorry for the trouble and thanks for the impecable support! no problem. glad it was resolved. Its can be tough keeping up. I love this tool to keeping blender up to date on windows. Hi, really enjoying hardops since recently purchasing it from gumroad. However, Blender crashes to desktop without even raising an error when attempting to use Insert to place a subset that allows for variable length (all other inserts work fine however). I installed manually through placing the files in the addons folder etc and everything else works perfectly. Is this a known issue or is it something I’m doing wrong? I’m running the most recent version available, 2.78c, and was when the issue was occuring. Any other solution you could think of? adjustable inserts are known to crash with certain versions of blender. This issue comes and goes but usually ceases with updates to blender. Im hoping with the official 2.79 that this will work without the crashes. Is it possible to get the example videos run slower. They are very useful but difficult to follow just because of its speed at least for me. Even a stoppage would be very useful. Went through the same and just decided to get DM full-price. I’m an unemployed student, and can say without doubt it’s worth every cent. Hi again. Every time I symmetrize (Alt+X), I have to select ” -X” direction on the “T” menu section Symm option. But I am sure that I am working exact the same xyz coordinates and same directions as your tutorial. 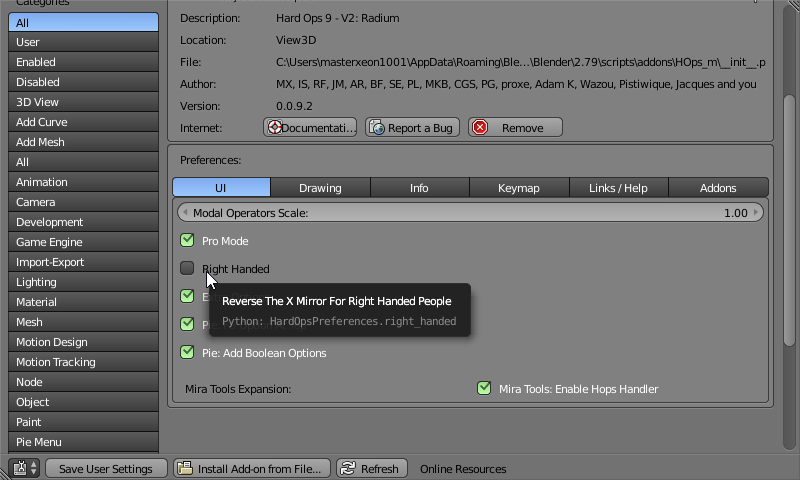 you will need to choose right handed in your hard ops prefs. what modifier is disabled? It might be a boolean from the look of it. You can’t. That’s not a feature. Asset management does though. have last version. Don’t know if it’s intended but everytime I subtract a mesh from another via booleans the original mesh changes status to Step (Cyan) and so I cannot change the bevel no more. Is it normal? lets see a gif of that. I assume youre using pie menu? Trying out Hardops, and looking great so far! Great workflow. But am experiencing a problem with some subsets. For example, when trying to insert the ‘holearray’ subset, I get the message that the ‘group ‘holearraySM’ does not exist in the assets file’. However, when I look into the substs.blend file (under the program files, Blender, add-ons folder), there is a group named as such. That group contains the AB and BB objects, but not an OB object. Is this a known issue, and could there be other subsets and insets that have this issue? thanks for the report. We’ll get that fixed! I’ll have that fixed in the next update but it more than likely was a typo on the png.